Welcome back to Technique Thursday (actually on Friday since I didn’t get a chance to post this yesterday!) Today I will show you how you can use the brayer and an embossing folder to create a unique background. But first, here’s my card! Do you see how the background is embossed and colored? That’s very easy to do when you know how to do it! First step is to ink your brayer (I used Pool Party on this card). Then roll the brayer on the inside of your embossing folder (top part, where the writing and Stampin’up logo are), in order to ink the top part. 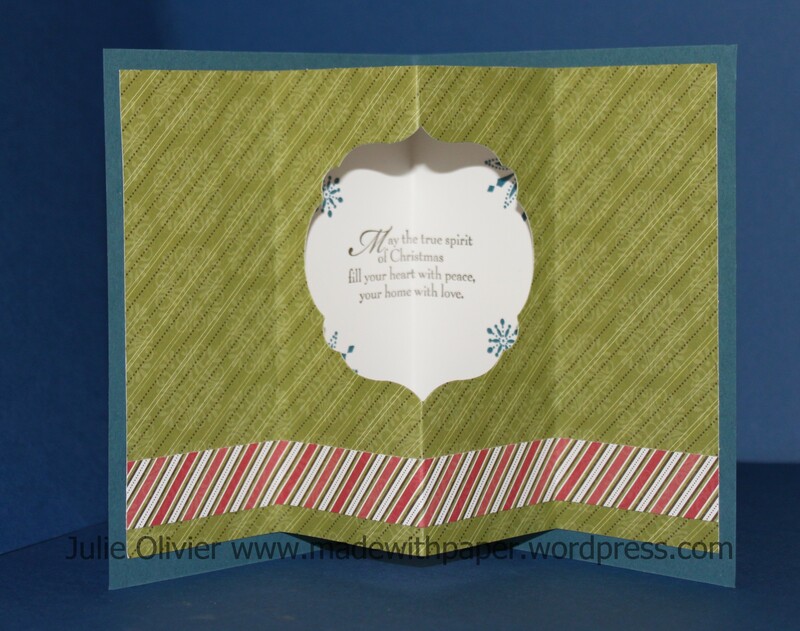 Place your White card stock inside your embossing folder and run through the Big Shot. 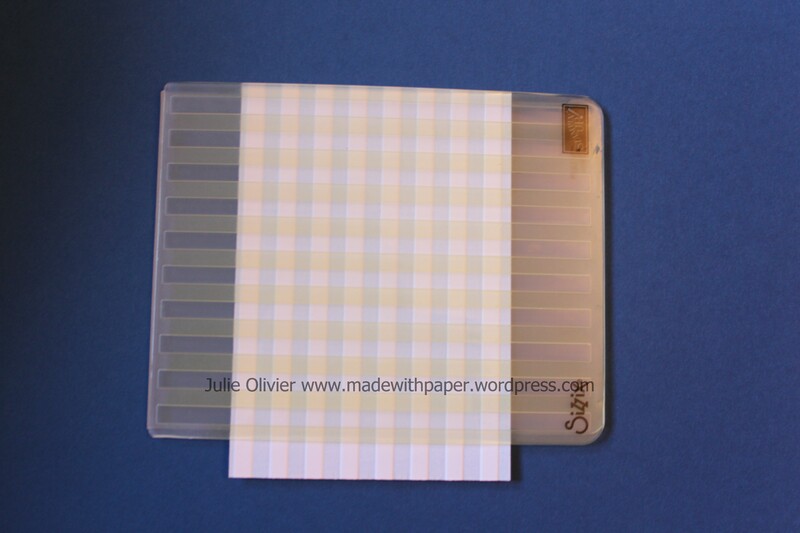 The ink on the embossing folder will transfer on your paper as it is embossed! Really cool! 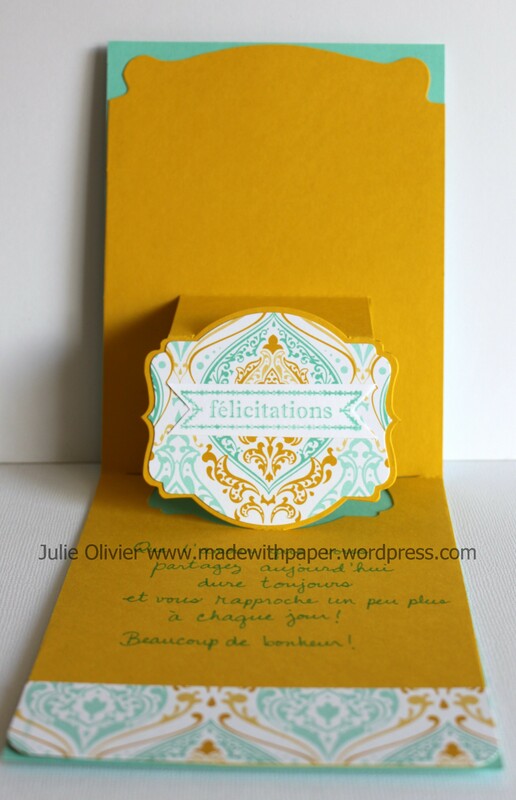 For this card, I used the “Beautifully Baroque” embossing folder. For the rest of the card, I used the Beautifully Baroque stamp with Coastal Cabana ink. I added some Daffodil Delight ink with the marker on the outer edge and with a sponge dauber (in the inside). I used the Oval Framelits to cut the 2 ovals. The Beautifully Baroque stamp and embossing folder can be bought together as a bundle for $23.75. Only available until June 2nd! Click here to order today! The Card base Pop ‘n Cuts and inserts are on sale right now 25%! Click here to order yours! These items will also be discontinued in a few days only. Tools: Brayer, Big shot, Beautifully Baroque embossing folder, Card Base Pop ‘n Cuts, Label Pop ‘n Cuts die, Ovals Collection Framelits dies, Deco Labels Collection dies, Itty Bitty punch pack, Large Oval punch. This is a card we made at my last Technique Class: All about the brayer! It is a simple card but still look sophisticated! And it has all to do with the brayer!!! For the brayering, I started with a Bashful Blue card stock and used two “sticky notes” to mask the areas that I didn’t want “Not Quite Navy” blue on. (See picture below.) The moon is a 1 inch Circle punch. For the ground, I tore the sticky note sheet to make a “rough” edge. Here’s a tip: When you brayer, you want to start from the top and gradually make your way down to the bottom. That way, the top part will be darker and you’ll see a gradient in the colors. I then stamped the birds (from Serene Silhouette set) in Midnight Muse. With the White Uni-Ball Signo Gel pen, I added some “snow” on the branches. Do you see the white spots? I think it makes all the difference! Tools: Brayer, Large Oval punch, 1″ Circle punch, Simply Scored Scoring Tool. I had a great week-end! I hope it was the same for you too! I celebrated my 11th anniversary with my dearest husband! I love him so much!!! This is the card I made for him. I have to tell you that it was inspired by a card I saw on Stampin’Connection (the website for all Stampin’up demonstrators) from Michelle Zindorf. She is the “Brayer Queen”!!! I modified her version to make an anniversary card instead. You can see her card if you click here. 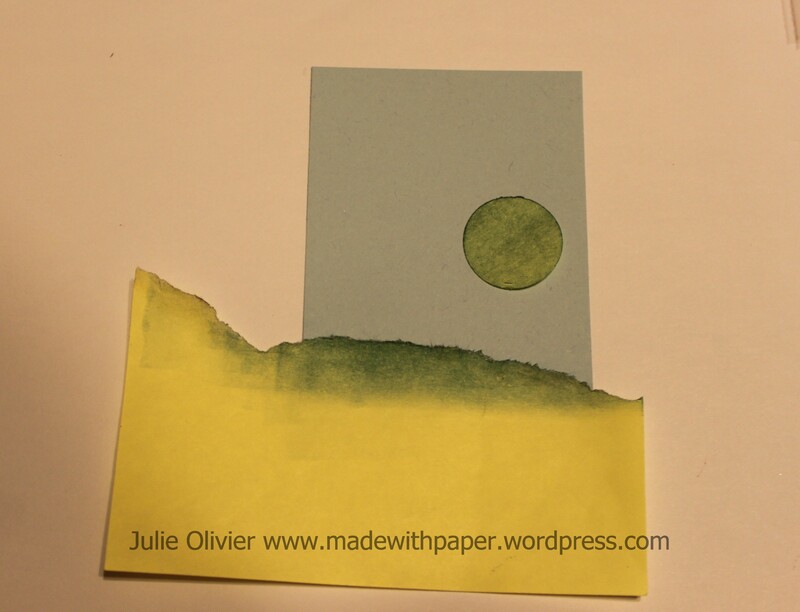 For the background, I used the brayer to make the sunset. I used Daffodil Delight, Lucky Limeade and Real Red. (The picture doesn’t really do justice to the colors, especially the green looks nothing like green! …) If you want to learn how to make these beautiful sunsets with the brayer, make sure to register for my Brayer Technique Class on September 11! Just email me at julie_olivier@hotmail.com to register! 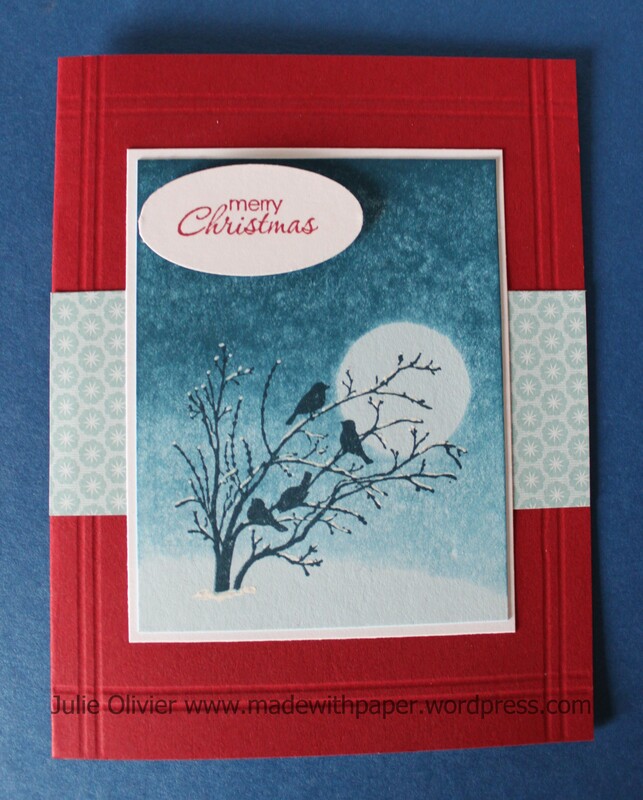 For the birds, I used the Bird Builder punch in Basic Black card stock. The little branches are also from the same punch. That’s a great punch to have!!! For the larger branch, I just cut it with scissors. This was my favorite card that I submitted to the Artisan Award contest. I worked on it until I was 100% happy and wouldn’t change a thing! It uses a “non-tradionnal” iris folding technique for the Christmas tree. I used 3 different designer series paper (from Letters to Santa and Paisley Petals) to get a variety of green, but all in the same color scheme. 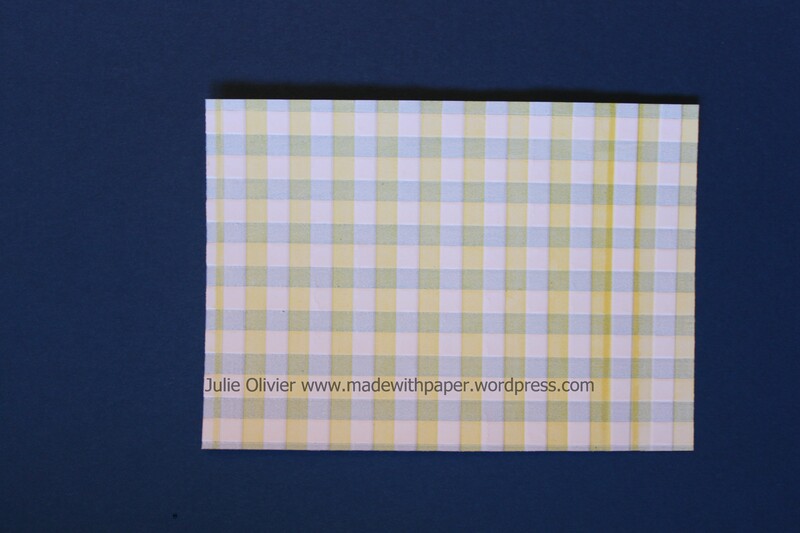 The background was brayered with “Not quite Navy” on Bashful blue card stock. I then stamped the trees from Plant Hope stamp set. 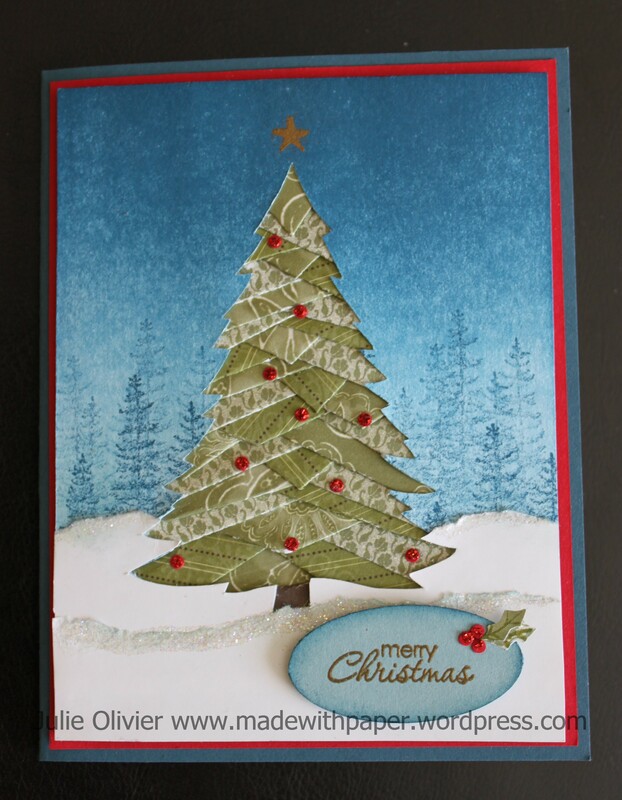 I used Cherry Cobbler Dazzling Details on small Real red circles (from the Owl Builder punch) to add some sparkles on my tree. The greeting and the star at the top of the tree were heat embossed in gold. For the snow, I tore Whisper White card stock and sponged the edges with Pool Party ink. (That’s hard to see on the picture.) I then added some Dazzling Diamond glitters with 2-Way glue on the edges. The inside of the card was also truly thought through! I did a tunnel card using the Labels Collection Framelits dies to cut the opening. I used Snow Swirled stamp set to stamp the greeting. Plant Hope, Petite Pairs and Snow Swirled (inside) stamp sets. Not quite Navy, Early Espresso and Pool Party Classic Stampin’ pads, Old Olive Stampin’marker, VersaMark pad, VersaMarker, Gold Stampin’ Emboss powder, Dazzling Diamonds Stampin’ Glitter, 2-Way glue, Dazzling Details (Cherry Cobbler), Owl Builder punch, Large Oval punch, Brayer, Heat Tool, Sponge, Big Shot and Labels Collection Framelits dies, Paper snips, Dimensionals, Multipurpose liquid glue, Snail adhesive. Hi! I’ve been away camping for a while and enjoying Summer! Sorry I haven’t been very active on my Blog!!! Today, I would like to propose you some baby cards that I made with a new stamp set I just got: Baby Prints (Bébéessentiels for the French one.) 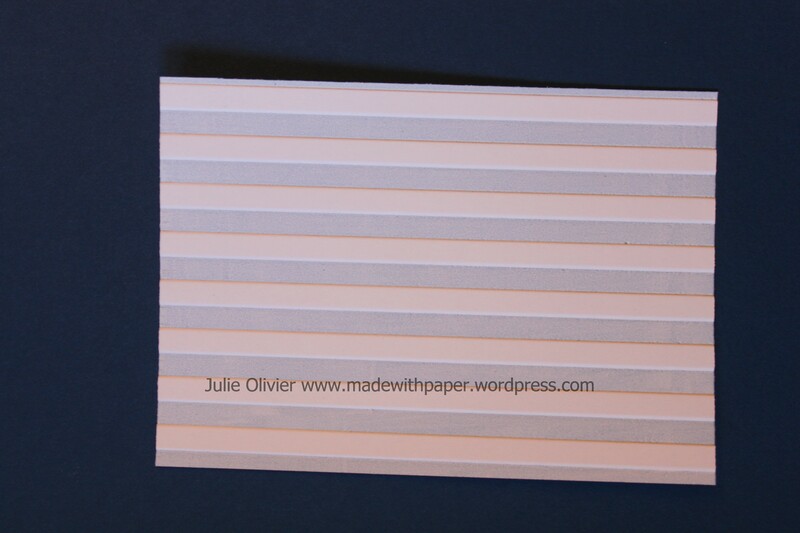 For the first one, I created my background paper with the Stripes embossing folder. Here’s how to do it: you will need your brayer and 2 color ink pads. For my card, I used Daffodil Delight and Bashful Blue. First, ink your brayer with the first color and brayer directly on the embossing folder (on the inside, the side that is on the top). Run through the BigShot. Second, clean throughly your brayer and your embossing folder. You can either use a baby wipe or run it directly under the water in your sink. Dry well. Re-ink your brayer with the second color. Rotate your paper at 90deg (see picture) and run through the Big Shot. 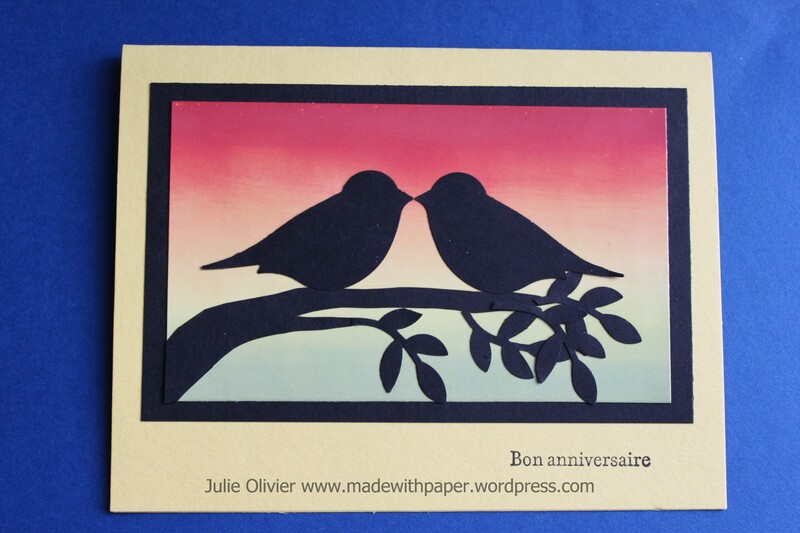 And here’s two more cards that I made using the Baby Print (Bébéessentiels) stamp set and Twitterpated Designer Series Paper and the Designer Series Paper Stack. CS and paper: Pretty in Pink, Melon Mambo, Designer Series Paper Stack, Whisper White. CS and paper: Baja Breeze, Bashful Blue,Whisper White, Twitterpaper DSP. The first one I made is one of my favourite because it’s one of those card that took some time and effort to make… Probably the picture doesn’t make it justice, but trust me, it looks really nice in real life! I wanted to do a “ship in a bottle” and I wanted to make the bottle look real. So I started by stamping the ship in Early Espresso and used the blender pen to color it. After cutting the shape of the bottle, I used the brayer to add some “Wild Wasabi” green ink to imitate the glass. I used a sponge to do the “bottom” of the bottle in a “round shape”. After, I stamped the whole bottle with versamark ink and put clear embossing powder everywhere on top. Heat set it and it now looks shiny like a real glass bottle. I made a “real” cork by cuting it in the cork sheet. 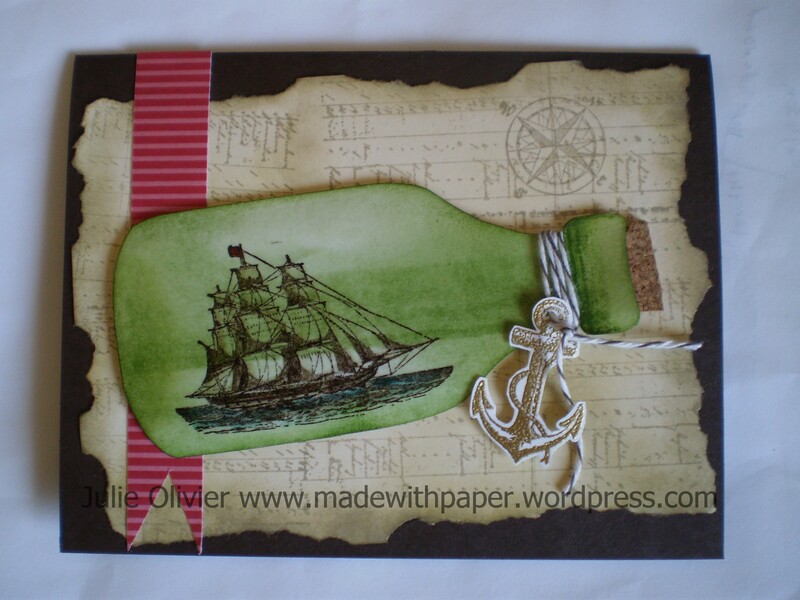 I used the gold embossing powder for the anchor and attached it with baker’s twine. For the background, I tore a piece of Very Vanilla card stock and stamped it in Crumb Cake with the other stamps of the set. I “aged” the paper by sponging it with Crumb Cake ink. A strip of Real Red Patterns Designer Series paper stack finishes the card. CS and paper: Early Espresso, Very Vanilla, Whisper White, Patterns Designer Series paper stack (Real red). “Fox and Friends” is a really cute stamp set and it will be retiring at the end of the month, so if you want to put your hands on it before it’s too late, let me know!!! 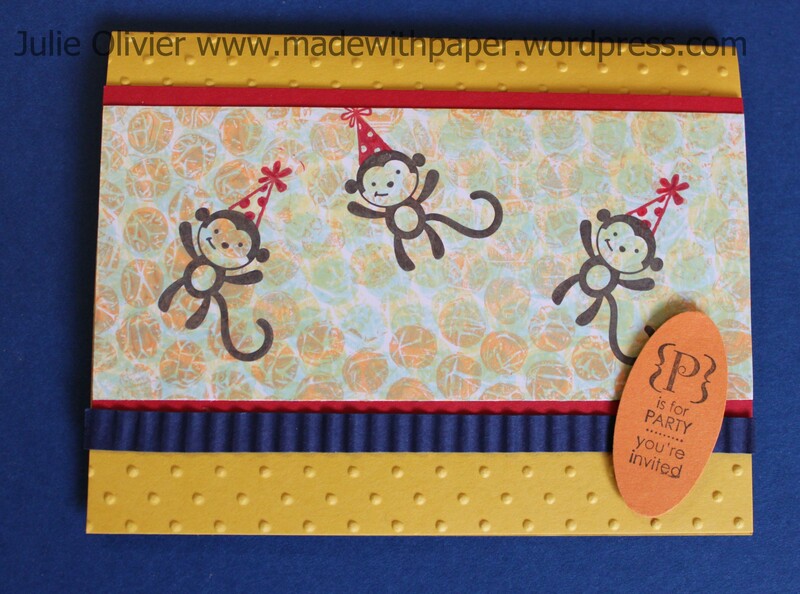 I used the monkey from that set to make this “party invitation” card. The little party hat is from “Turtle and Co” (remember this one is also going at the end of the month!) “P” is for Party is from the Occasions Alphabet. 2- Repeat the same process with “Pool Party” ink (light turquoise) and ” Pumpkin Pie” ink (orange). Voilà!!! Hope you like this new technique! Ink: Daffodil Delight, Pool Party, Pumpkin Pie, Real Red, Early Expresso, Real red Stampin’ Marker. Tools and punches: Large Oval, Big Shot and Perfect Polka Dots embossing folder, Crimper.